The annual Honey Gold mango harvest will begin a month earlier than it has traditionally begun when our mango farm at Humpty Doo, near Darwin in the Northern Territory, begins producing fruit in October 2020. Our Honey Gold farm – a portion of a vast joint venture holding – was established when the first 17,000 trees were planted over 70 hectares in 2016. Another 3,000 trees were planted in 2017 with 11,000 more in 2018. The warm and humid coastal climate of the Darwin region, which experiences cooler summers and warmer winters than other Top End growing regions by several degrees, promotes earlier mango flowering and fruit set, resulting in an earlier harvest by up to a month. Piñata Farms owns half of a 400-hectare land holding in this region. Some 150 hectares has been set aside for mango production. Progressive planting will continue in coming years until all land is under cultivation. As well as mangoes, we also have pineapples under cultivation at this property. We have strategically selected Darwin as a mango-growing region to extend the start of Honey Gold season and meet consumer demand for quality, Australian mangoes. 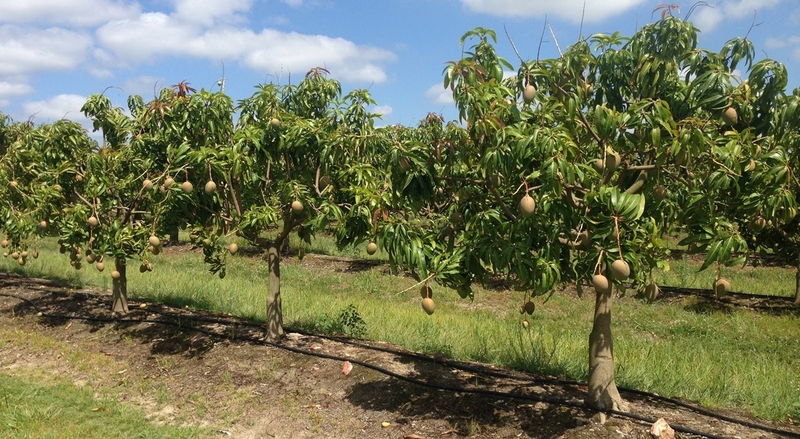 A small team is employed to develop the Darwin mango farm. When the first harvest begins, tonnes of Honey Gold mangoes will be plucked from the trees daily from October to November, despatched to ripening centres, then sent to supermarket customers nationally. Night harvesting is in place throughout all Top End regions to retain freshness and keep fruit blemish-free.